Do Shorter Emails Work Better? One question we get often is how long should your emails be that you are sending to your subscriber list? 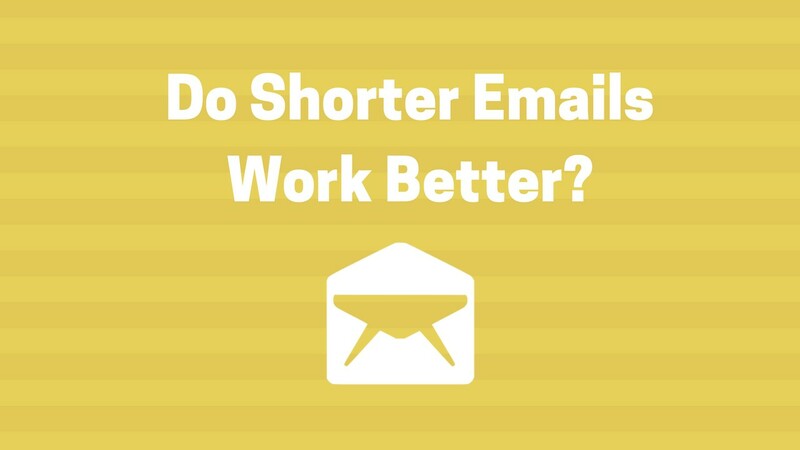 And do shorter emails work better than longer emails or vice versa? Here is my take.. If you’re trying to improve your email success rate, the biggest thing you can do is make sure your emails are being sent to the RIGHT people on your list. ConvertKit has a cool feature called tagging which allows you to group subscribers into different buckets. You can serve them with content that makes sense to them based on what their interests are and this should increase the open rates and click through rates in your emails. To use tagging effectively, you should set up your email forms and autoresponder series based on topics on your blog. For example, if someone reads a post on AskNickFoy.com about Pinterest then I want to have an opt-in form on that page that gives away a freebie resource related to Pinterest. The form should also then subscribe them to an autoresponder series that sends emails related to Pinterest. This is an advanced strategy to help you get more intentional with what emails you’re sending to your subscribers rather than sending general emails to everyone. But in times that people send shorter emails to their subscribers, it usually is because they have a direct to the point message they want to relay and a specific call to action they want the subscriber to see. If they send longer copy, they risk the subscriber skimming or skipping over this important part of the email. For example, if I’m announcing a product sale, I would send a shorter email to ensure my subscriber takes action and clicks the link to check out my sale. Longer form emails can help you build more authority and trust. You get more space to share a lesson or tips with your subscriber. You can add in more links. The downside to longer emails is that you don’t create that curiosity that causes someone to click the link in the email. With a short email, you can say a few sentences and then tell them to click the link if they want to learn more or see what you’re offering. This sparks that curiosity inside someone’s brain enticing them to want to click the link. Overall your emails should respond to your subscribers needs. Send them relevant content with catchy subject lines and you’ll see an increase in open rates and click through rates on the links you insert inside the emails. If you want to test short vs long emails, then divide up your subscribers into two groups. Write a series of longer emails for one autoresponder series and a series of shorter emails for another autoresponder series. Then sit back and see what happens as both groups go through the emails. But I still believe if you divide up your subscribers into buckets based on their needs and interests that this will produce the best results for you. If you enjoyed today’s article on email marketing tips, be sure to check out my tutorial on how to use ConvertKit and the tagging feature we discussed that can segment subscribers into specific groups based on their interests. P.S. Don’t forget to join my email newsletter for weekly lessons and tips to help you with online marketing and social media growth.